St. Augustine of Hippo (354-430) - After the passing of the first generation of Christian leaders (i.e. the Apostles), the church needed new teachers to step forward and disciple the growing number of converts. And there was no shortage of presbyters who met the task. Some of the most well known and influential were Ignatius, Justin Martyr, Irenaeus, Tertullian and Origen. They have been dubbed the "Early Christian Fathers". Arguably the most important was a man named Augustine. He became Bishop of Hippo Regius in North Africa (modern Algeria), but his journey to that post was a long and interesting one. Unlike most people in antiquity, he wrote an autobiography (which survives) so we know quite a bit about his life. He was born in Tagaste, North Africa in 354 to a pagan father and Christian mother (although his father became a Christian just before his death). Early in life, he rejected his mother's faith and gravitated toward his father's ideas. As a young man, he came under the influence of a Manichaeism, which was considered a heretical branch of Christianity known as gnosticism. One of the primary tenets of Manichaeism was that the God of the Old Testament was distinct from the God of the New. 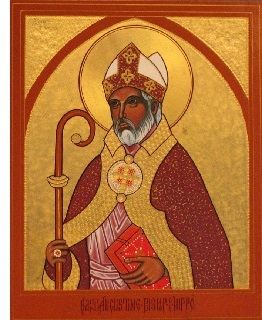 Initially, Augustine was repulsed by the violence of the Old Testament and rejected the notion that they could be the same God. At the same time, he indulged in a hedonistic lifestyle, engaging in whatever worldly pleasure he saw fit. After about a decade, however, he became disillusioned with Manichaeism and stopped following it. Augustine was regarded as a man of tremendous intellect and after careful study, felt there were too many inconsistencies in Manichaean doctrine. In 383, he traveled to Rome and became a teacher of rhetoric. As a devotee of philosophy, he considered himself a neoplatonist and also was heavily influenced by the writings of Cicero. Then the following year, he moved to Milan where he met Ambrose, the Bishop of Milan, who is also considered an early church father. The two shared many interests including philosophy, and Augustine was impressed by his skill as an orator. He found Ambrose's arguments in favor of Christianity persuasive, reasoning that the grace of God was indispensable to human freedom on earth; and at the same time was able to reconcile, for Augustine, many of the difficulties he was having with the Old Testament. He also saw no conflict with his neoplatonist ideas, and, in fact, believed the New Testament adequately answered the problem of evil in the world with which Augustine had been struggling. From his perspective, all the criteria for becoming a Christian had been met on an intellectual basis. The final obstacle to his conversion was his hedonism. He was reluctant to abandon his indulgence of physical pleasure. Over the years, he had been involved in a relationship with a concubine and even had a son by her. But his mother, who joined him in Milan convinced him to end the relationship and get engaged. He agreed, but had to wait two years while the young girl came of age (which in those days was 13). In the meantime, he decided to enter into another relationship with another woman. After the two years had passed, however, he not only ended his relationship with her, but decided not to get married either. In 386, he finally became a Christian after reading an account of Saint Anthony of the Desert. Ironically, after years of relationships with several women, he chose to live a monastic life and instead devote with rest of it to intellectual pursuits. In 388, he decided to return to Africa, but tragically, both his mother and son died on the trip back. He suddenly found himself without any family at all. Upon returning to Tagaste, he established a monastery and was ordained as a priest in nearby Hippo Regius in 391. He quickly built a reputation as a powerful preacher and became the Bishop of Hippo Regius in 396; a position which he held until his death in 430. Of his many works, perhaps his two most important are the City of God and Confessions. Confessions is his autobiographical work, and City of God was a treatise to contrast the temporal condition of the earth to the eternal state of Heaven. Rome had been sacked in 410 (see Rome sacked - again) and the city was in turmoil. It had been called the "Eternal City" and many people literally believed it would exist forever. After it was attacked, followers of the old religion blamed Christianity, claiming the gods had abandoned Rome. City of God, written after this traumatic event, was Augustine's response.